Because SAM relies on it’s nearly 500 volunteers to make the museum run, we’re taking the time to share a bit about them with you, the adoring art lovers that interact with our volunteers every time you enter our doors, whether you realize it or not. Volunteers at SAM lead tours, check coats, staff the information desk, and more. This month we spotlight Chris Karamatas, a SAM volunteer since 2015. SAM: What is your current role? 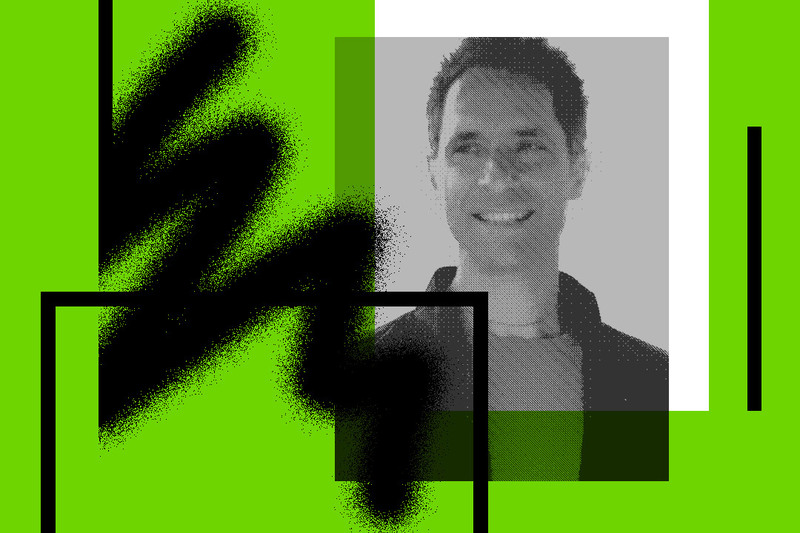 Karamatas: I am excited to be the incoming Chair for the Seattle Art Museum Volunteer Association (SAMVA) Executive Committee. 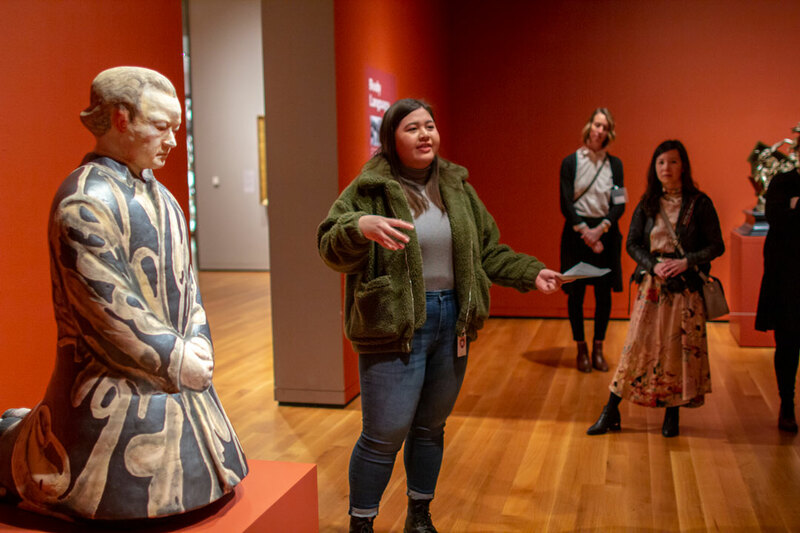 We try to address the needs, and improve effectiveness of each of the dozen volunteer groups, in support SAM’s mission—and ultimately improve our patrons’ experience and appreciation of SAM and art. I am also part of the SAMbassador program, so on Saturdays you might find me in the galleries interacting with visitors. What are your current favorite pieces? SAM had a beautiful exhibit of Robert Davidson a few years back, so I am grateful to Barbara, and all the curators who have introduced me to so many artists who I would not otherwise have ever known. I appreciate the form lines of Native American art, and the associated stories. In this piece Davidson merges modern art with traditional native techniques (of form lines and the ovoid and u-shape, ); add those great colors: wow! I especially like the freer preparatory sketch we have on display, but then going in to the Porcelain Room and looking up at the ceiling at the finished fresco is stunning. I like the depiction of Valor prevailing over Time (who watches helplessly from the shadows below, his scythe overturned), and over Ignorance (in the lower corner). Within the stiffness of rock one is able to capture, movement and flow. I am always in awe that over 2,000 years ago as a species we humans were able to create such beauty, and aspire towards certain high ideals. I sometimes wonder what beauty we will leave behind that our descendants will similarly admire 2,000 years from now. Based on traditional Kente cloth from Ghana, El Anatsui creates these beautiful glimmering regal textiles from discarded metallic materials like old can pieces, bottle caps, and parts from liquor bottles. I appreciate the reference to his African culture: the significance of cloth which traditionally commemorates significant events, as well as the reference of libations to honor ancestors. But also perhaps a commentary on refuse, abuse, and consumerism. I am drawn to its scale and textures. In this work the sunflowers represent the stars, and the connection between heaven and earth. There is a companion piece where Keifer is laying on the ground with a star filled sky above. Gorky created a series of these abstracts helping usher in abstract impressionism here in America. It was a brief moment of relative happiness in an otherwise tragic life, as he recalls memories of his past. Primal, intense, minimal, powerful . . . I can almost picture the artist carving into his canvas in a subtractive manor, perhaps partly influenced by action art of the abstract impressionists, or a reaction to their color fields. And living though the dark times of the Vietnam War, assassinations, etc. The different materials, overloaded with symbolism. But the cold metal barbed wire, wooden hedgehog barrier, and the light shining within (perhaps spelling something) is like a visual poem to me. It’s fresh, it’s colorful, whimsical, and fun. The abstract shapes convey a feeling of perhaps overindulging. I like how Masson experimented with altered states of consciousness and certain fundamental human impulses. The unique perspective (water, land, sky), and how the artist captures dusk—I would love to see the other 11 paintings he did of this same location, but at different times. The combination of different themes, western and Aboriginal in this case, makes this piece special. Beyond visual arts, what else inspires you? When I first moved to Washington I was introduced to local poet Sam Hamill and his collection Destination Zero is still one of my favorites. Films like Wim Wenders’ Wings of Desire also move me. The cinematography is beautiful, and his examination of what makes us human and the divine is poetic. I also play guitar and love music. Musician Nick Cave appeals to me (he also appears in the above film). I like a lot of the late 70’s British scene, bands like The Jam. Also like the Icelandic band Sigur Ros. What is a simple hack, trick, or advice that you’ve used over time to help you better fulfil your role? 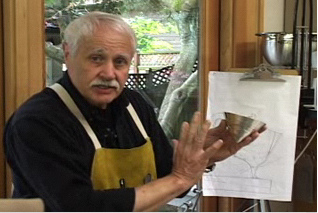 I try to always listen, I have learned so much from visitors. I try to be aware of my body language (from not crossing hands, to smiling). Treat people with care and act as if they are guests visiting my house. Anything else you wish to share? I just want to express my gratitude to all the outstanding people that make the Seattle Art Museum such a great place; all the volunteers, my SAMbassador colleagues, the SAMVA board, Visitor Services Officers, SAM staff (especially Jenny and Danie), the curators, and of course our director Kimerly. I am always impressed with their generosity, kindness and dedication. 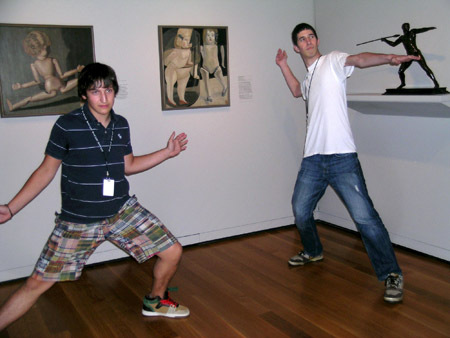 This summer, two very bright and curious high school seniors helped out in the museum’s curatorial division. Milo and Henry spent their summer helping organize our object records, and researching several works in the SAM collection. Here, they write about their experience. 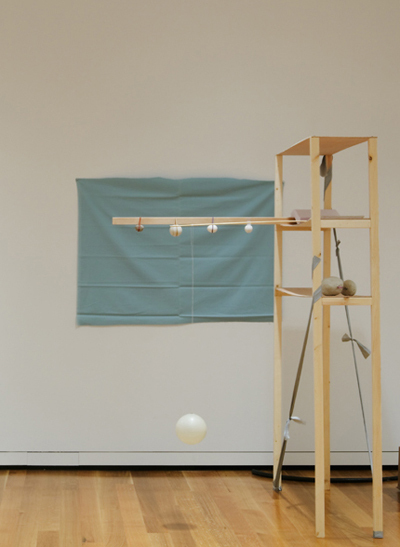 The SAM Next Heide Hinrichs installation Borrowed tails closes this Sunday. In conjunction with the closing we wanted to publish a conversation between the exhibition curator, Marisa Sanchez, Assistant Curator of Modern and Contemporary Art and the artist Heide Hinrichs. When a natural disaster strikes, like the recent earthquake in China1, saving human lives is naturally the first concern. In the aftermath however, the loss of cultural artifacts and historic sites can be devastating to communities as well. Art and architecture provide evidence of our shared histories and give us a foundation on which to build a common identity. Living in Seattle, an area of the world prone to seismic activity, one might ask what Fremont would be like without its troll, or the Seattle skyline without the Space Needle? Hopefully, we will never know. The History in Art History, Part II: How This Painting Came to Seattle! 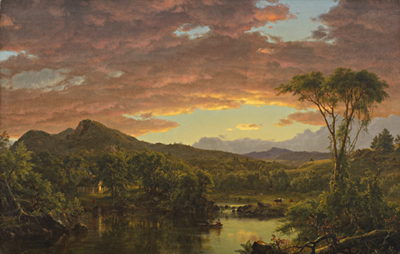 Recently I blogged about the scant history of the museum’s magnificent painting by Frederic Church, entitled A Country Home, which was a gift to the museum in 1965 from one Mrs. Paul C. Carmichael. For five years I’ve been wanting to learn more about Mrs. Carmichael and how she came to Seattle and how she came to bring with her her great grandfather’s impressive picture by Church. I’ve been surprisingly lucky in research so many times that I’m now convinced that some strange forces guide our hands as we delve into the past—forces that make sure that lives are never forgotten. The forces directed me to Mrs. Carmichael just last week. Recently, Decorative Arts curator Julie Emerson was able to commission a coffee and tea service from silversmith John Marshall for our collection. It’s a very cool process (both commissioning and making), something the Dec Arts department had never been able to do before—that collection had always focused on historic American and European material.